BENTOCLEAN is a synthetic polyelectrolite used in oil, gas and water well drilling as breaker of filter cakes formed by bentonites, clays and natural or synthetic polymers. BENTOCLEAN has an immediate breaking action better than polyphosphates. BENTOCLEAN completely breaks any cake formed by the action of ýrilling fluids on oil, gas and water producing formations; it cleans the formation and eliminates any damage. 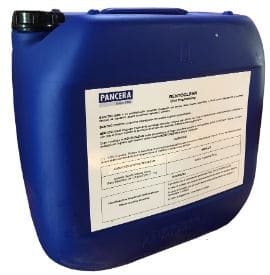 After using BENTOCLEAN in the stimulation of fresh waterbeds it is advisable, before using the produced water, to effect a thorough clean up in order to eliminate any residue of BENTOCLEAN . 0,1- 0,6 % in water. Bring the solution to contact the producing layers and leave to soak for about 6-8 hrs. in the stimulation of waterbeds wash abundantly with water before using the produced water. Packaging: 25 kg plastic drums. Sicurity sheet: Substance hazard identification: the product isn’t considered dangerous reg.ce 1272/2008 (CLP). In case of skin contact wash with plenty of soap and water. In case of eye contact wash abundantly with water and consult a doctor. In case of ingestion consult a doctor.